Usually when one talks of skies falling, it means something falling from it. In the world of Strangereal (the world of Ace Combat), something fell alright, and it was big. So big in fact, it set the stage for the stories to follow for almost the whole series. A referencing of heavens doesn’t necessarily mean anything Judeo-Christian, more or less just the heights of the skies. But in this context, it could reference “Dancing with the Angels” in Ace Combat 6. 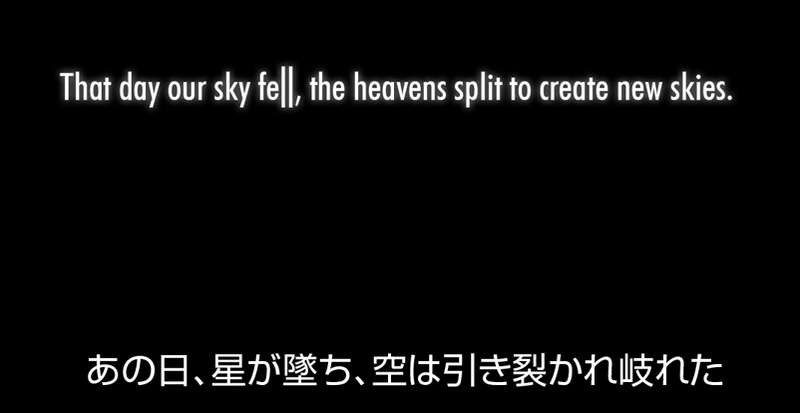 But these heavens “Splitting to create new skies” brings back the old subtitle to Ace Combat 04, “Shattered Skies“. It also seems to reference what the Ulysses meteor did when it made impact with Strangereal. Instead of falling as one unit, it split up into many different fragments when it passed the Roche limit. The teaser site doesn’t give anymore clues beyond this. Nothing further in the copyright section, page source, nada. The only thing consistent with what we’ve been seeing so far and what’s here now is the favicon being the first teaser image we saw for this game, what ever this is. Lastly, outside of the site, a user at Siliconera, Tristan Diaz, points out that a trademark was filed by Namco Bandai on July 11 (yesterday as of this writing), and that this game could very well be called Ace Combat: Infinity. So now this brings up some old questions. Is this a new game? Is it a reboot? Looks like we’ll know very soon.